Great Chicago Party Bus Deals! Getting a deal on your party bus adventure! Every ride is a deal with our company! Paying for professional transportation doesn't have to be as intimidating as most people make it out to be. You're already at an advantage being in the presence of a company who does everything to balance affordable prices and amazing quality of service. Did you know you can get Chicago party bus deals by trying to book during periods of time that aren't as busy for us? We get an influx of business on Friday and Saturday, when there are big events in town, and when weddings and proms are happening. If you can try to book on a day that's outside of those areas, you're looking at some seriously awesome Chicago party bus deals. Here are some ideas to brainstorm that work perfectly for cheaper rates in the Winter, or for a weekday excursion since these are two periods of time that are often a lot more affordable! They're all completely free too, so you can save on entertainment and transportation when you take these suggestions. 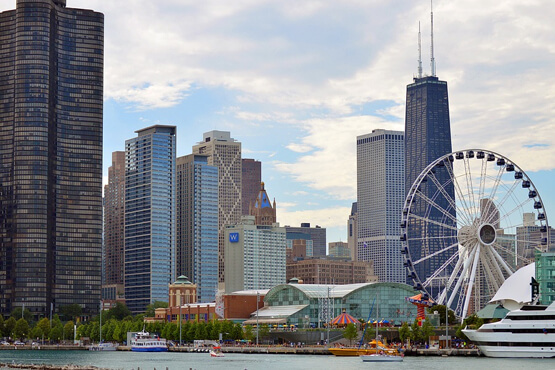 You could spend an entire day checking out the shops, restaurants, cinemas, and boat tours at this hot spot for tourism and recreation in Chicago. Some of the eateries you can check out include DMK Burger & Fish Bar as well as Big City Chicken. The beer garden is a laid back place to chill and enjoy your favorite beverage while over looking the beautiful Lake Michigan. Don't forget to check out the Ferris wheel that boasts 200 feet. Those who enjoy electrifying art will love checking out this art center which has free admission daily from 10AM to 7PM. The Polish American artist has certainly made a name for himself in Chicago with bright, intense paintings that are reminiscent of Andy Warhol. If you like pop art, it's going to be an inspiring visit here. Indie Rock fans can rejoice at this famous venue! It doesn't have a cover on Mondays, and drinks are incredibly cheap. It might not look like a happening spot from the outside, but you'll see the stark transformation once you come in the doors. If you don't want to check out the live music, you can head to the front of the club which houses a pool table and pinball machine. This park can be found inside of the Millennium park. We decided to add it in because in the winter time it has an amazing ice skating rink. This park is most suitable for families and children, but the addition of ice skating makes it perfect for all ages to enjoy. There you have it! Four awesome activities that could easily take up your entire day. Our Chicago party bus deals will add to your experience in a way that no other transportation service can. Let's set up your trip now!